Sal is one of the "islands of the sun" within the archipelago of Cape Verde, located off the Senegalese coast. 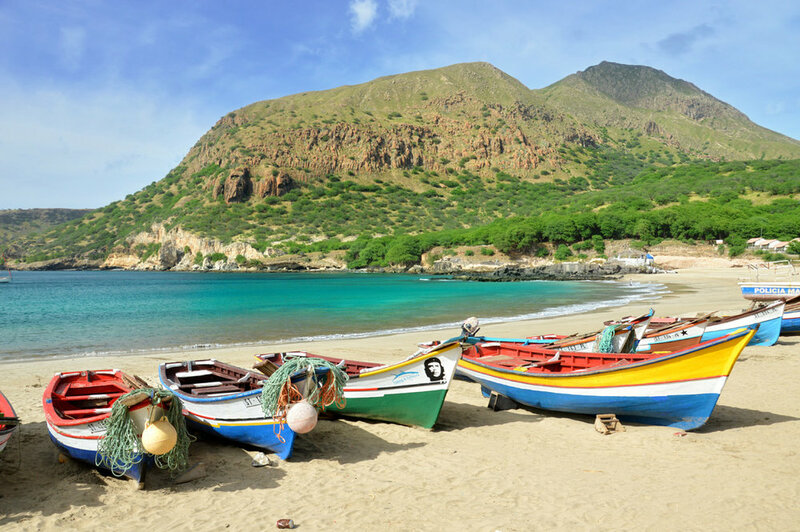 It is the most touristic island where nearly 50 % of winter sun seekers who come from Europe to Cape Verde stay on vacation. Most probably, it is Sal that will be your first contact with this tiny African Country. The island boasts various types of white, sandy beaches suitable for swimming as well as surfing, kitesurfing and diving. Tourist infrastructure is very well developed with multiple hotels and resorts along the coast. If you love lazy beach holidays, you'll find it perfect. However, if you wish to experience some authentic African culture or local life, you won't get it in Sal. The whole island is solely dedicated to tourism and besides the western-style resorts, there's nothing much original there. If you travel from Europe, there should be no problem whatsoever in getting to Sal. In fact, we chose Cape Verde because of a week of time off available and insanely cheap fares from Brussels - 170 EUR (185 USD) return! Such a price is insane for nearly 6 hour flight to Africa! You simply cannot say no to an offer like that! Cape Verde is still a virtually unknown destination and we hadn't had any idea what to expect. But this kind of spontaneous trips are the best! If you're not a member of an organized tour with the transport, hotels and everything else arranged (I guess 95 % of passengers of our plane were), you'll have to take a taxi yourself. The most popular town in Sal is Santa Maria where all the beaches are located. The ride takes only around 20 minutes but the taxi drivers will probably ask as much as 1300 CVE - Cape Verdean Escudos (12 EUR/13 USD). Just say no and walk away from the airport pretending you'll take a bus (local buses run from the capital Espargos to Santa Maria near the road outside the airport). When you do that, the taxi fare may drop down to around 800 CVE (7 EUR/8 USD). It really helps if you have someone with you who speaks Portuguese. Note, that in many places euro notes are accepted, however it's better to pay in escudos as the rate is 1 EUR = 110 CVE. If you pay in euro, the rate will be calculated at 1 EUR = 100 CVE. The rate at the airport is not bad, so you can easily change your currency there. If you wish to buy flights to other islands (do visit other islands! ), you can do so at the airport (the fares are the same as online and at the official tourism offices in the towns). At Sal airport, you'll also see a tourist office that sells daily tours to different islands. I doubt however, you'll be willing to buy one as the prices go as high as 300 EUR/330 USD per tour! There is a lot of confusing information online regarding the Cape Verdean Visa. Some websites state you'll have to pay 40 EUR in order to get it in advance. Wikitravel says that you have to obtain the visa beforehand if you arrive from a country that has the embassy of Cape Verde. This is not true. You can easily purchase a visa (for virtually all western countries) at arrival hall for 25 EUR. There's no need to arrange it in advance, even if the Cape Verdean embassy is present in your country. Most of the passengers will have their visa arranged (as most of them travel as a part of an organized tour). Thus, the line will most likely be short. In front of us, there were only 5 people and we got our visas within 15 minutes or so. Before touching down in Sal, the plane had a stopover in Boa Vista, the nearby island where some of the passengers left and others got in. Boa Vista is a twin of Sal - very dry, very sunny and can be windy. Then, after taking off from Boa Vista, we experienced the shortest flight ever on a large, commercial airplane - the entire journey took only 7 minutes to reach Sal. During the landing, the island of Sal seemed infinitely empty and arid. It looked like a dusty semi-desert with absolutely nothing around, no landmark or anything that could have caught your eye. Although I like spending a day or two at the seaside (especially on wild beaches surrounded by cliffs), I don't enjoy being in a crowd of other westerners in the hotels and resorts specially built for tourists. Nevertheless, the island of Sal didn't turn out as "bad" as I thought. I put "bad" in quotation marks because it all is very subjective. For those who love swimming in hotel swimming pools and lying on a beach or just to relax - it's perfect. But for those who want to explore the country the way it really is - Sal lacks what other islands have - authenticity, spectacular nature and little historical villages without crowds of tourists. However, it doesn't mean there's nothing there. It's a nice place to have some rest and take a swim in the warm, clear sea before setting off on an adventure to explore the other islands. You can visit the entire island of Sal within one day. The public transport runs only between Santa Maria and Espargos. If you don't drive, you can find cheap day tours in Santa Maria. Sal is the cheapest island to get around due to the number of tourists. However, search around as some tour agencies may offer tours at ridiculous prices. A day tour should not cost more than 20 EUR (22 USD) per person and you'll be able to see all the places mentioned below. Santa Maria is the village in the very south of the island. It's popular with tourists due to the long beaches, clear sea and many restaurants and cafes. If you're lucky, you can even observe see turtles running to the sea at night. There are many hotels and resorts around the town, some are quite far from the center. It's better to stay in the town - at least you'll see a glimpse of the local way of life. You can also find some tour agencies here as well as souvenir stalls whose owners may try to talk you into buying some of the most expensive ever seashells or little wooden statues (we were asked to pay 30 EUR for 2 tiny items! We didn't buy them, of course.) It's better to avoid it - you can find way cheaper and locally made craft items in other islands. Espargos is the capital of the island - a lot less touristy with accommodation a bit cheaper than in Santa Maria. It's located right beside the international airport - 2 km (1.25 miles) away. The name originates from "asparagus" - a wild vegetable that grows around the island. There's not much to see in the town itself, however it does have a few beautifully decorated with graffiti buildings (which are bundant in Cape Verde). You can also visit a nearby port of Palmeira. 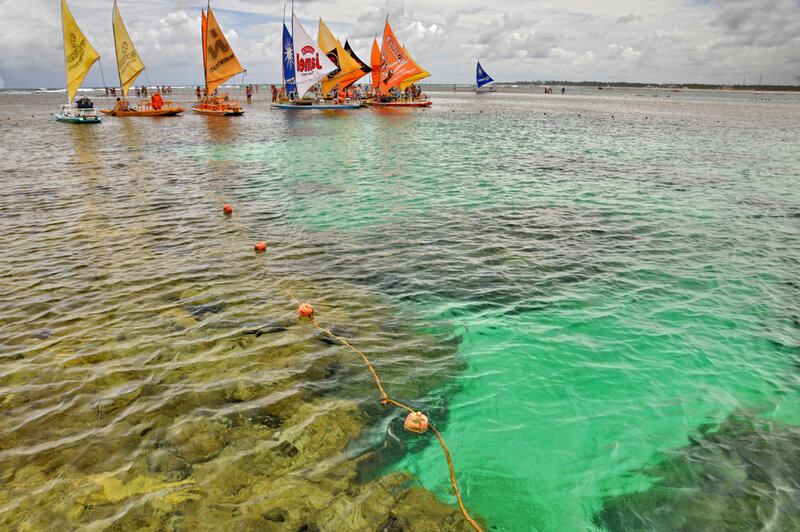 The salinas is one of the most popular attraction of Sal, besides its beaches. The salt evaporation ponds were created on the natural salt lake within the crater of an extinct volcano and it's the salt production that gave the fame and even the name to the island. It is possible to swim (or rather float) in the pools - experience is similar to swimming in the Dead Sea - due to the high salt content, it's virtually impossible to sink there. Entry fee is 500 CVE. The salt business flourished until the first half of the 20th century - in front of the tunnel, you can still see the shipwrecks that once were used for transporting this precious condiment. There's also a lonely church which looks really dramatic surrounded by the barren landscapes of the island. Buracona is a natural pool made of volcanic rock and sea water - it has a beautiful, blue color that contrasts with the dark grey basalt formations. The extremely high waves that feed this natural pond with water are an attraction in itself. This place is the only completely different spot from all other attractions in Sal - and it was my favorite. Close to Buracona, you can see a hole in the ground filled with sea water, called Olho Azul - the Blue Eye. During the right time of the day, the light shines through it and illuminates the sea water creating an extremely turquoise hue. You may be surprised by the prices. Some of the budget hotels or guest houses may not have hot water and the pressure may be really low, but you'll have to pay as much as you would pay for a good quality hostel in Western Europe or for a really nice room in the East. It seems that prices are in contrast a lot between local and tourist items. The prices for a meal in a nice, touristic restaurant at the sea side can be 10-15 EUR (11-17 USD). Forget an amazing meal and a pint of beer for 5 EUR, like in the Balkans. However, if you choose a cheaper, more local restaurant, it can be considerable cheaper, especially during lunch hours. The food (especially seafood) is delicious. All the fish we ordered were of the best quality. It's not advisable, however, to eat salad - it's better to order some boiled vegetables just to be sure you won't get any stomach problems. Do not stay too long in Sal! Cape Verde is so unique and diverse that it truly deserves way more recognition. Although so close from Sal, the other islands are so different, that it's difficult to believe it's the same archipelago. We had a chance to see Santiago, Fogo and Brava. Unfortunately, most of the visitors that come to Cape Verde, do not go anywhere beyond Sal or Boa Vista. They have no idea what they're missing! The Santiago island, located to the south, is the most populous island and it's the cultural center of Cape Verde. The capital - Praia - is located here and Santiago is the most African island of all. Apart from the beaches in the north, the central parts of Santiago boast amazing mountainous peaks which are much greener than the rest of it. It is a transitional island between the hot and dry eastern islands and wetter and greener western ones. Fogo and Brava are green, quiet and idyllic. 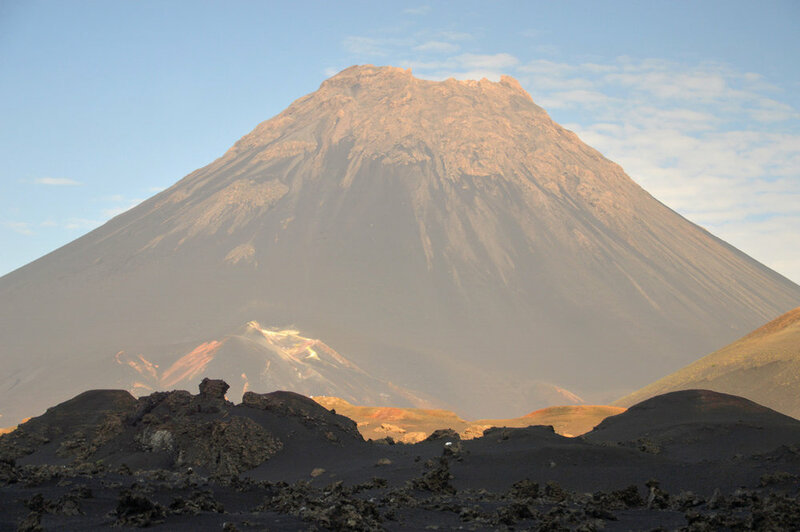 Fogo's main attraction is the active volcano which erupted as recently as 2014! There were no fatalities but the village situated within the crater suffered enormous damage. Now, the locals have returned and are rebuilding their homes. Fogo island has a completely unique culture and round houses made of lava rock will blow your mind. Brava is the greenest of all and it always has a cloud hanging above it. This microclimate allows the trees and flora to flourish - it's completely opposite to Sal. 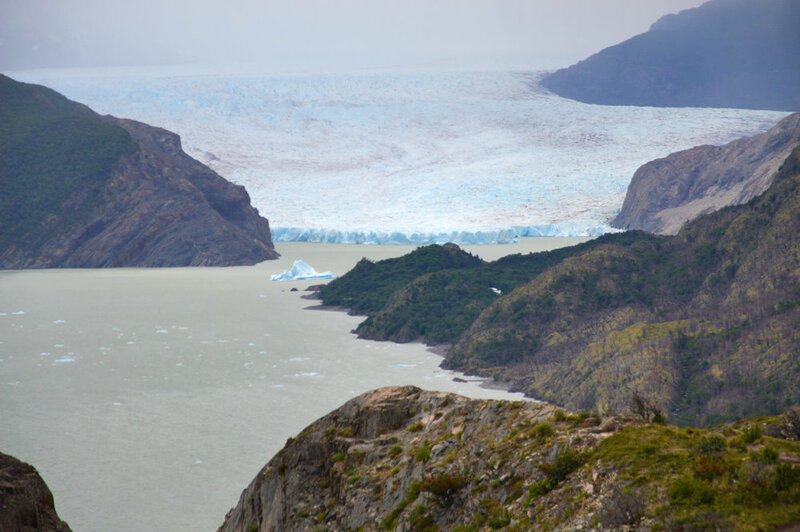 Rugged cliffs, beautiful scenic views as well as cozy, sleepy villages. And, literally no foreigners. All this on one of the smallest island of Cape Verde. It's difficult not to enjoy this little, spectacular world! Have a look at "Related Posts" below to find more articles about Cape Verde.